After about a six-week hiatus, I'm happy to bring back the UnderTOw column! The weekly write-up about landmarks in Toronto public spaces had to take a break while I changed living quarters, but should be back up and running for at least the rest of the summer. This week's landmark is the Amsterdam Bridge at the Harbourfront Centre. Straddling the gap between York and John Quay at the Harbourfront Centre is a white bridge that most of us are familiar with. It's a perfect place to get an elevated view of the inner harbour, steal a kiss from a loved one, or read up about the industrial heritage of the site (there's a plaque about halfway across the bridge). This bridge is called the Amsterdam Bridge, and although it might be a good spot to enjoy a clandestine puff, there's actually a more symbolic explanation behind its name. 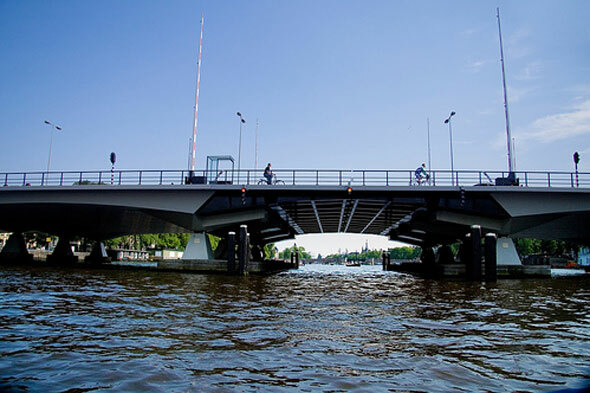 The Amsterdam Bridge was opened in June of 1978 by the then-mayor of Amsterdam, Wim Polak. The bridge not only connects two quays, but also the cities of Toronto and Amsterdam in sisterhood. Although Toronto has been loosening up in recent years, it's hard to imagine a city more opposed to the spirit and letter of the law of Toronto the Good than Amsterdam. Maybe we need to join in sisterhood with a few other European cities to relax our liquor laws and get some work done on our bike lanes, too. I haven't been to Amsterdam, but when I finally to make it over, I'll be sure to visit the Torontobrug, the reciprocating bridge on the other side of the pond (pictured above). At 120 metres long and heavy with the weight of vehicular traffic, the Torontobrug is much larger than the Amsterdam Bridge in Toronto. Running over the Amstel River, it's young, functional, and sturdy, which is only appropriate given the city it's named after. Thirty years later, the team responsible for re-designing the central waterfront hails from the Netherlands, reminding us of the connection between the two places. In time, more bridges will connect the now-disjointed slip heads along Lake Ontario, bringing connectivity back to the waterfront. It'll only be a matter of time before those new bridges are covered with lovers, too. The UnderTOw is a weekly column that asks the question, "How'd That Get There?" It explores the landmarks in Toronto's public spaces that act as metaphors in the city's story, running like a current beneath the urban landscape. Top image by me, second one by Flickr user breeblebox.